Ahh, yes, the romance is still alive. Mr. Right loves to tease me with little surprises – he’ll send me text messages throughout the day to tell me he has some surprise or other waiting for me when I get home. He loves to tantalize me and make me guess, never revealing any hints or clues, because he knows it drives me absolutely crazy. Yesterday was no different – I got a text late in the afternoon letting me know I’d be coming home to a surprise. It was just about the same time, as I was sitting at my desk, that I started to feel a bit puny. I was worried that the sickness I have battled all year was coming back, much to my dismay, since I’ve been so healthy for six whole weeks and was finally feeling confident that my new meds can be a long-term solution. But there was no mistaking that the feverish, achey, crummy feeling was returning, and it didn’t look good. And then it got worse, as I walked to my car in the 100-degree heat. And worse as I ran to the grocery store to get our healthy-diet essentials. And as I checked out… I knew it was about to get ugly. 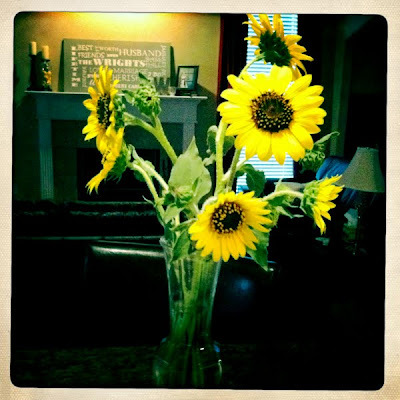 So now you can picture the scene – I come home, and my sweet husband has hand-picked the most gorgeous sunflowers, and sitting next to it is another one of his amazing love letters. I was almost in tears, it was so kind. Except I knew I was about to lose my lunch. Welcome to marriage, and all the realities it brings. Thankfully I think I just ate something bad, and don’t think I’m coming down with that stupid sickness again. And once I had gathered myself again, I was able to thank my sweet husband for his thoughtfulness, and then ask him to make me some oatmeal so I could eat something while laying on the couch. I’ll tell you what else is true love. 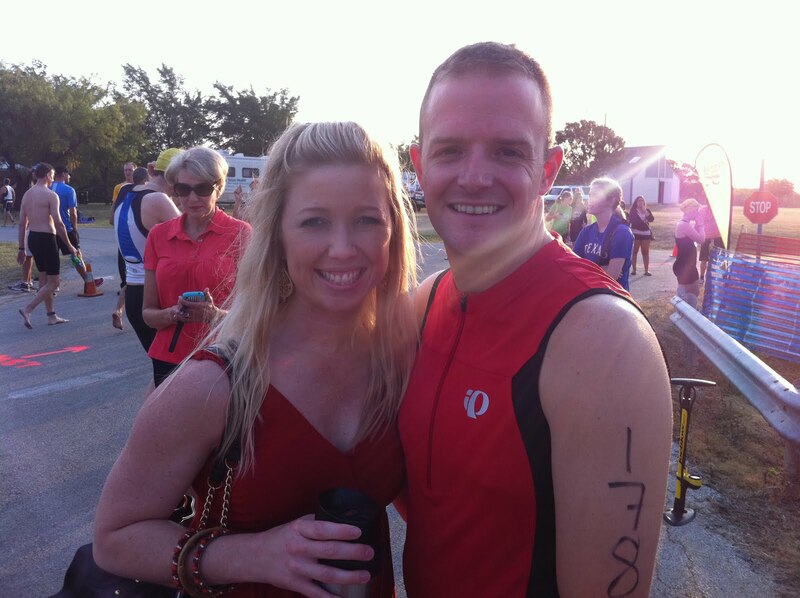 Waking up at 3:45 a.m. on a Saturday to go watch your husband run a triathlon. That’s a full four hours earlier than I normally wake up on Saturdays. But I did it because I love him and because I really like that his favorite hobby also keeps him healthy, and because I don’t mind a good excuse to see him wear spandex head-to-toe. Mr. 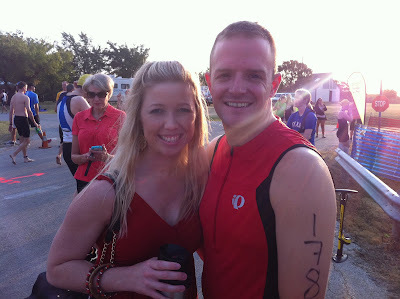 Right did GREAT at his race, and I was brimming with pride for my triathlon-competing man. I also LOVED the people watching that goes with any sort of race – they bring out all kinds of characters. I can happily say that running in a triathlon will NEVER make my bucket list because (1) I don’t like to get my hair wet, (2) I haven’t worn all spandex since I retired from cheerleading, and I am happy to leave those fashion-days in the past, and (3) it takes me a really long time to get ready, so rushing around in the “transition area” to switch from the swim to the bike, or the bike to the run, just seems stressful and unnecessary. And so I will be content to go watch my man compete instead, while I sit in my lawn chair and sip my morning coffee. PS–I have to confess that I have missed my first two workouts of the week. The first, because I was exhausted from the weekend (not only did we have the triathlon, but then we drove straight to Oklahoma for a whirlwind trip to visit family, and then drove back home at 5:30 Sunday morning). The second, because I was still a bit nauseous from last night. I cross my heart and hope to ice cream that I WILL get up tomorrow at 5:30 for some P90x cardio. There, now I feel better. 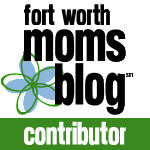 PPS–I know what you’re thinking… I’m not pregnant. I feel I have to throw that out there anytime I mention feeling under the weather. Okay– I'm guilty of “going there” with my assumptions of nausea… 😉 can you blame me? Growing a baby does indeed make you vomit and make you tired! Stephanie – It's okay, I do the same thing!